So begins the rollicking chase around Matti's Kitchen and out into the countryside as Matti's mother, his father, the cat, and the dog run after the boisterous, bouncing Gingerbread Baby, only to be joined by a flock of goats, Martha and Madeline, a crowd of villagers and more. The Gingerbread Baby stays just out of reach, daring them to catch him all along the way! But Matti's not with them. He's at home, and we see him in the borders patting and rolling and putting something into the oven. What is he making? Will he ever see the Gingerbread Baby again? Yes! In a delicious twist at the end that surprises even the mischievous Gingerbread Baby. 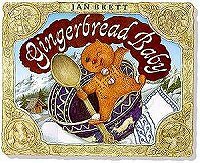 Jan Brett's lively and beautifully detailed paintings catch the spirit of a favorite old tale through her cheeky little Gingerbread Baby and the colorful cast of characters who pursue him through a tiny Swiss village surrounded by forest and mountain.